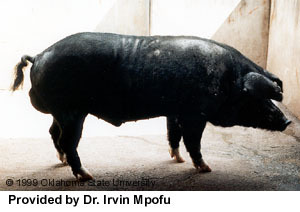 Mukota pigs are believed to have been introduced by the European and Chinese traders between 16 and 1700 AD. There are basically two classes of Mukota pigs. One class is short, fat and has a short snout resembling the Chinese Lard pig, while the other resembles the Windsnyer (Wind cutter) in being long nosed with a razor back. They are however both black in color without any shades or spots. The latter class predominates in Zimbabwe and is also found in some parts of Mozambique and Zambia. There are about 70,000 Mukota pigs in Zimbabwe. The first comprehensive study on indigenous pigs in Zimbabwe was done in 1973 with pigs from an area in the North Eastern part of Zimbabwe called Mukota, hence their name. 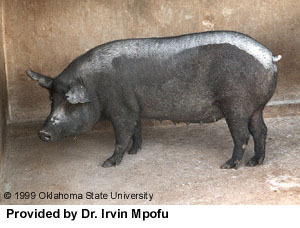 Mukota pig are well known to be hardy and well adapted to the harsh tropical environment in terms of heat stress, disease resistance and inadequate nutrition. 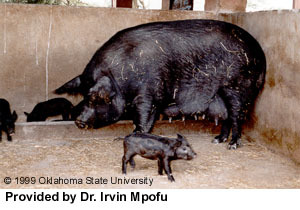 Naturally Mukota pigs have a selective advantage to survive and reproduce on low plane of nutrition. Water consumption is also very low. For example 6 litres (1.5 gallons) per litter is adequate weekly. The low plane of nutrition here refers to low energy, low protein and high fiber. It has an enlarged caecum were elaborate hind-gut fermentation occurs making it able to strive on high fibrous diets compared to other pig breeds. Mukota pigs can easily survive under very unhygienic conditions testifying to their high disease resistance. Mukota pigs are kept free ranging during the dry season (from June to October) and in pig houses or fold yards during the rainy season (November to May). Mating is uncontrolled during the free ranging period. Reproduction cycle follows an annual rhythm with peak season of farrowing occurring during the early rainy season in October/November. The age at first litter ranges from 6 to 12 months. The average litter size is between 6.5 and 7.5. Weaning is natural. The total weight of litter as a proportion of the sow weight is of the same order (i.e. 11 %) as for Large White or Landrace, so this means there is scope for genetic improvement through selection. Possibilities being considered at the moment involves divergent selection using a potentially small fat Mukota dam (well adapted to harsh conditions) crossed with a large lean sire to produce slaughter generation. This will allow exploitation of hybrid vigor and produce an efficient growing pig reared from a hardy mother subsisting in a constrained environment. The carcass yield is about 30% less than from the exotic Large White. However the meat has exceptional organoleptic properties. It is popularly known to have "sweet" meat in Zimbabwe. Holness, D.H. 1995. The tropical agriculturalist - PIGS. CTA/Macmillan, London. pp 16-48.